Hey, summer's here! Temperatures are rising, you can't go outside without sunglasses and some SPF 1000 sunscreen, and the entire city is out, smiling and laughing and soaking up the summertime vibes! 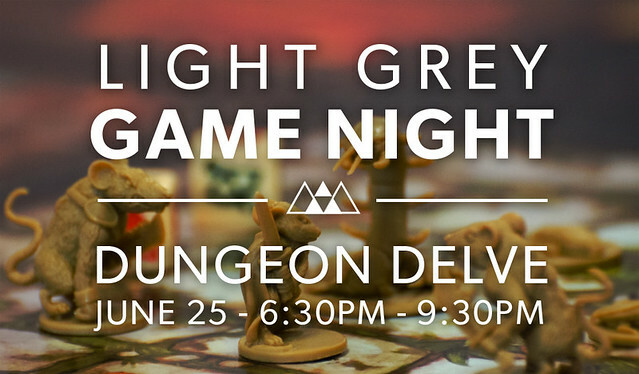 If it sounds like reason enough to you to go hide in a deep, dark, dank dungeon, that must mean it's time for another Light Grey Game Night! So mark your calendar for Thursday, June 25th from 6:30 - 9:30 pm! As you might remember, we're attaching a theme to each night to help people narrow down what games they might want to bring (although you're still welcome to bring whatever you'd like!). This week's theme is Dungeon Delve! So come prepared creep through the darkness in Dungeons & Dragons: The Legend of Drizzt Board Game, explore a tiny, adorable dungeon in Mice and Mystics, bust up a SPACE dungeon in Star Wars: Imperial Assault, or wimp out and make some other fool go in your place in Welcome To The Dungeon, among plenty of others! If you have a favorite board game, bring it! The first time I am here and it is very interesting site. I love to play games and it is my stress release actually from the difficult work schedules I have. That will be great fun. Just memories those moments. Great gratitude for these. Thanks a lot. Wish you good luck. This is great. Thanks for sharing this article. Amazing work. Article finds the result. It seems like an interesting game. I read about it somewhere else too. I found it different and unique. Reading about it here makes me wanna go for it. Thanks for sharing. Credit cards have now become one of the indistinguishable parts of our day to day life. It has solved out the problem of financial crises up to a great extent. With the changing trends and advancements in technology; credit cards have now become an indistinguishable part of the different day to day activities which we can’t avoid at all. This is very nice article and thank you for sharing this. Students can improve their writing skill by reading such an article and they have to contact with custom writing service for better result.